(MENAFN - DailyFX) Asia Pacific Market Open Talking Points Canadian Dollar drops with crude oil prices as BoC fuels rate cut bets Wall Street swings as US earnings season begins with mixed results Australian Dollar at risk if RBA minutes build on global growth risks Trade all the major global economic data live as it populates in the economic calendar and follow the live coverage for key events listed in the DailyFX Webinars . We'd love to have you along. FX News Monday The Canadian Dollar underperformed on Monday alongside volatility in crude oil prices. It began with downside gaps which may have been as a result of growing concerns about a provincial election in Alberta that may create uncertainty for a portion of Canada's energy sector . This was then followed by a slew of disappointing Canadian economic data. Bank of Canada's overall business outlook survey contracted 0.6 in the first quarter of 2019 which was the first negative outcome since 2016. Accompanying this was growing concerns about inflation expectations from the central bank. 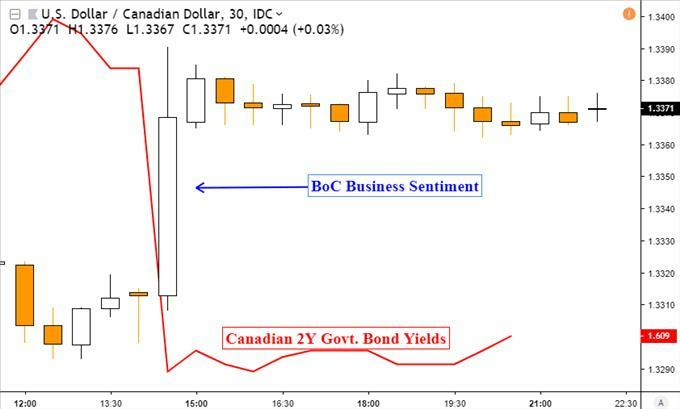 On the chart below, you can see Canadian front-end government bond yields falling as USD/CAD rose. This reflected increased BoC rate cut expectations. Check out the DailyFX Economic Calendar for critical currency event risk! USD/CAD Technical Analysis USD/CAD still remains in a well-defined range between 1.3251 and 1.3469 after support held over the past 24 hours yet again. This may signal that perhaps it could be readying up to test resistance next. On the other hand, the daily chart below shows that if there is a downside breakout, that requires overcoming more psychological barriers than a turn higher. These include former resistance from early 2019 and rising support from late January. Tuesday's Asia Pacific Trading Session Sentiment-oriented currencies such as the Australian and New Zealand Dollars could be looking to a mixed start as Tuesday gets underway. A mixed beginning to the US earnings season, with Goldman Sachs and Citigroup having just passed , saw Wall Street swing as the S & P 500 ended more-or-less little changed at -0.06%. As such, Asia equities may be heading for consolidation. AUD/USD could be vulnerable to monetary policy fundamental themes, with the RBA minutes from the April meeting on the docket. This is because the central bank has been slowing hinting that it is watching certain risks to their outlook such as slowing global growth. If the document echoes and builds on growing concerns from policymakers, the Aussie may weaken.